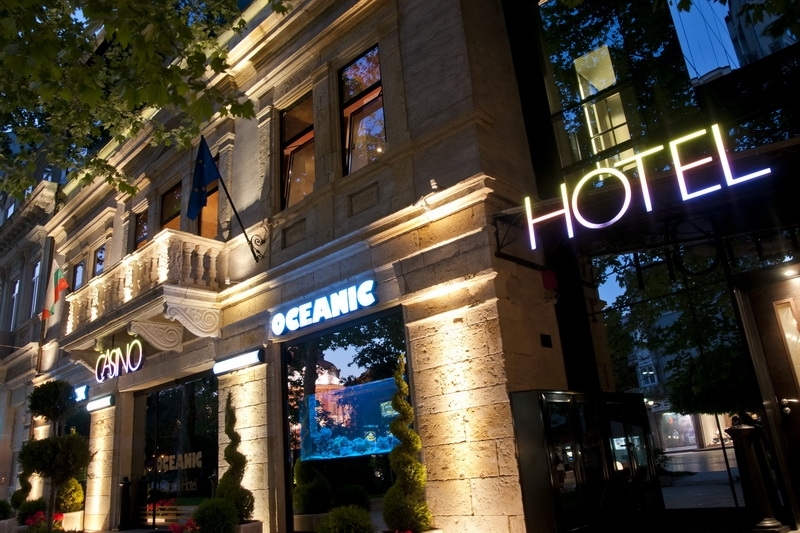 Location: Oceanic Hotel and Casino is located in the top center of Varna city on Nezavisitmost square, not far from the Dormition of the Most Holy Mother of God Cathedral – the symbol of Varna. Accommodation: 5 single, 6 double rooms and one presidential apartment. All premises are equipped with flat screen TV, mini bar, telephone, safe, hairdryer, free internet access, A/C with individual control, audio system. In the hotel: breakfast room, Casino with 68 slot machines and electronic roulette, betting room with 10 plasma screens, 28 seat places, satellite cable TV, computer, bar, main restaurant with 100 seats, panorama restaurant with 16 seats, lobby bar, café, nigh bar, 2 conference halls. The price include: breakfast, internet and all taxes.